The MGCD is a console to JAMMA converter created by Taiwanese company Frolicker, and distributed by many Taiwanese arcade resellers. 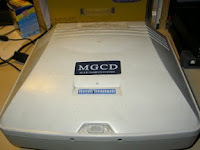 Several versions of the MGCD were produced for Dreamcast, Playstation2, Gamecube, and Xbox. What makes the MGCD unique to other pay-to-play console timer PCBs, was the MGCD could be programed to recognize the start game screen of a particular title, as well as the end game screen, allowing it to disable all input, sound, and even video, until the game was fully loaded and start game screen ready. So in a sense, the MGCD could disguise the fact that you were playing the console version of an arcade game. Here is the manual for the MGCD-B Version, showing all the nifty features and settings. For a pretty stupid reason, the MGCD isn't exactly plug and play with most JAMMA setups. The problem is in the fact that the MGCD maps 12 player action buttons to the jamma finger board, utilizing the last 2 pins on each side, which are typically tied to ground on most JAMMA looms. If these connections are tied to ground, the MGCD will not boot up properly, and simply not work. To get around this, you must either modify your JAMMA loom connector of your cabinet, detaching the ground wires to these last pins, and connecting them to player buttons 5 & 6, or just leave them off completely. So instead of modifying my cabinet, I just created a fingerboard which lifts these last two pins on each side, allowing me to play on any JAMMA cab. If I wanted to use these last two buttons for fighting games, I could simply run a wire to the fingerboard up to the control panel. Leave the last two pins on either side disconnected. Similar to other pay-for-play "timer" PCBs, the MGCD can also play credits for time, although with an annoying timer countdown that is displayed once per minute at the bottom of the screen. With the limited number of games recognized by the MGCD firmware, the timer feature is primarily used by most people, where you can setup a single credit to play for a maximum of 256 minutes. The problem, of course, is that that annoying time displayed at the bottom of the screen. Figuring out how to remove the timer overlay took some trial and error. At first I tried re-routing the RGB video signal from the console output, directly to the front of the fingerboard. This did work, but the signal was unamplified, and too dark/weak to be displayed on an arcade monitor. So the only other option was to figure out which chip on the MGCD was doing the video overlay, and disabling it. This took a lot of probing around, but eventually I found the chip, and grounded one of the legs to effectively disable it. Video timer overlay chip highlighted in red. Connecting these two pins (highlighted in red) will disable the video timer overlay. Now here is what the output looks like without the timer. Finally, here is the MGCD installed on my PS2, and ready to be played on any JAMMA machine. I was lucky to buy Ketsui back in early 2005 while the hype (and monetary value) was still at a relative low point. Since then, the game had grown into legend with the failed Arika PS2 port and superplay debacle, failed Mame dump attempt, soaring PCB prices, and DS mini-game version giving only a glimpse of this classic Cave style play. With the recently released 5pb port of the game on Xbox 360, now those who typically trolled the forums with angst towards PCB owners are finally getting their own taste of the game, and realizing it may have been worth the hype as one of Cave's top produced games this decade. So how does the port stack up against the PCB? Lets find out. At a recent Bay Area shmupmeet, a side-by-side comparison was setup for participants to judge for themselves. In an attempt to level the playing field, two identical arcade cabinets were used with sanwa arcade controls and tri-sync arcade monitors. The original PCB runs natively at 15khz video resolution, while the XB360's lowest setting 640x480 resolution was used. Obvious differences in the graphical look were apparent, but most participants didn't much mind the XB360 scaled graphics, which were helped by various filters used to reduce the blockiness. A noticable lack of formal HD graphics, and no scanline display options in the 5pb port pailed in comparison to the previous two Cave ports (Mushihemesama Futari, and Espgaluda II). Its arguable that external scaling hardware could be used to restore a 15khz display with native scanlines, although this would not be considered "pixel perfect" by purists. The only Cave ports that have "pixel perfect" bestowed upon them are Arika's PS2 Espgaluda and PS2 DoDonPachi Dai-Ou-Jou, which both run at a native 15khz (non-interlaced). From this distance, both PCB and port look identical (despite a slight color variation in the monitors), but the game speed was noticeably different. The next noticeable difference when playing the port was the game speed, which felt slightly faster than the original PCB. Again another compromise when porting a low resolution arcade game to a modern console that displays on consumer LCD screens and television sets. Does this really effect the playability of the port? Certainly not. But rest assured, console players will be quick to point out that they are playing at a slight disadvantage to the PCB. Lastly, the sound, which normally a port should exceed the PCB, given it can play in stereo and with newly arranged soundtracks, but unfortunately the port being based on the last Ketsui rom fix, includes the slightly louder lock-on sound, which can be quite annoying if you are used to the original PCB rom. Of course with the fixed roms comes no chance of the game crashing during the demo sequence, which I've never personally witnessed on my PCB since I don't use freeplay settings. So what makes the port better than the PCB? Being an order of magnitude cheaper than the cost of the PCB is certainly a bonus, but the port has many advantages over the PCB which can't be denied. First and foremost is an all new arrange mode, which takes bullet canceling in Ketsui to a new level. I haven't spent much time with this mode yet, but it certainly looks fun, despite it not being created by IKD/Cave. Next on my list would have to be the ability to practice individual levels, without which progress for me on the PCB has been quite slow. Being able to practice Stage 4 and 5 the past two days has been a great time saver, not to mention much more pleasurable without making those minor mistakes in the first 3 stages which prevent you from having a high scoring run. Something lacking, is the ability to practice individual bosses, which seems odd given this has been a standard in almost every other Cave port to date. Last are typical XB360 port features such as arrange soundtrack, online leaderboards with downloadable replays, gamer icons, and wallpapers, all which don't interest me much to be honest. The replays are a nice tool to help see how others approach the game, but there have been plenty of Ketsui superplays/DVDs available before now, its really only worth watching if someone exceeds these previous records. In Summary, the port is definitely worth owning, and all who played it at the shmupmeet thought it was faithful to the PCB (ignoring the slight speed difference). Unfortunately, 5pb's effort pales in comparison to previous Cave ports in terms of features, modes, and settings. This may be due to the high amount of pressure to release the game on time, and bug free, unlike their failed Dai-Ou-Jou 360 attempt. The question now remains if the port sufficiently bursts the hype bubble around the PCB to deflate its value to any significant degree. Given the largely positive feedback I've read on the forums, I think this may take longer than expected due to a now wider acknowledgment that Ketsui is indeed one of Cave's finest.